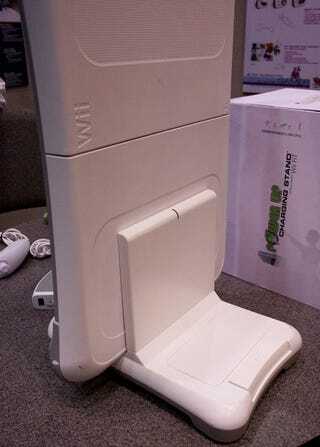 You can use the Wii Balance Board for Wii Fit, but if you're smart, you'll stick to Punch-Out. Regardless, Mad Catz' upcoming Power Up Charging Station will make your Balance Board rechargeable. The stand is bundled with a special, contact-charging battery that replaces the standard AAs. You load the battery into the board, the board into the stand, and ZAMMO! Your Balance Board recharges. Mad Catz also used some of the stand's body to integrate two USB ports, in case you'd like to recharge any of your other gear. And a foot pedal makes for an easy board release.